If you’re preparing to buy a used car for the first time, you need to learn how to identify tire tread wear patterns. This knowledge helps you get value for money because you can get a lower price by knowing what to look for. You also need this information if you’re planning to buy a used spare tire for an upcoming road trip. Apart from car purchases and trips, checking your treads regularly also helps you avoid accidents. Let’s look at the common causes of tire tread wear and how to fix these problems. What is wheel alignment? It refers to the adjusting of your steering wheel and suspension systems to maintain the auto manufacturer’s recommendation. What is the importance of wheel alignment? It enables you to drive your car at the highest safety standards by enhancing your tires performance. Alignment ensures that your wheels remain steady while driving in any weather condition. How often should you have your alignment checked? If you have a new car, then you need to get one every two years. However, bad driving habits, such as stomping on the brakes every time has a greater effect on your tires and suspension. If you do a lot of off-road bumping, you’ll need an alignment annually. When you release the steering wheel, your vehicle pulls either to the left or right. A well-aligned vehicle should maintain a straight course. You notice uneven front tire wear patterns because the car tends to drift in one direction. You need to hold your steering wheel at a certain angle in order to drive straight. The toes of your tires appear hidden beneath the car. The toe refers to your front tire angle from an aerial view. What is tire balancing? It refers to the even distribution of a car’s weight so that tires can rotate without wobbling. You’ll meet people who wrongly assume that tire balancing refers to wheel alignment. However, wheel alignment focuses on maintaining your suspension and tires in the right angles while tire balancing is all about weight distribution. You can’t do one without the other. That’s why mechanics advise car owners to get their wheels aligned right after purchasing a new set of tires. How often should you get your tires balanced? When you’ve bought a new set of tires. Balancing determines whether the tires need extra weight. If you’ve just completed 5,000 miles, rebalancing is necessary due to the wear and tear on your tires. Motorists who spend a lot of time on off-roads need tire balancing annually. You should also get tire balancing when you’re about to embark on a long road trip. This enables your tires to perform optimally when you load your car trunk with luggage. Increased fuel consumption rate – This occurs when there’s excess weight on your front or back tires due to poor tire balancing. The engine uses up a higher amount of energy to pull its weight and it causes a higher consumption rate of gas. Unusual vibrations – While driving, the steering wheel, and floor start vibrating. This happens because your unbalanced tires become strained beneath the weight of your car. The uneven weight distribution makes your tires wobble while in motion. When you over-inflate a car tire, it loses shape. The center bulges out and side treads barely touch the ground. This obviously affects alignment because the toes shift from your auto manufacturer’s recommended angles. The new shape exerts more force on your tire’s center and this increases friction while driving. That’s why you’ll notice your tires seem bald at the center but still have good side treads. Unfortunately, you can’t fix this problem once it happens. However, you can avoid it by following your auto manufacturer’s PSI guidelines. How does under inflation affect your tire treads? The sidewalls tend to sag because the insufficient pressure cannot give your tire a firm round shape. When the tire rotates, a lot of friction occurs on your sidewalls. It will take a short time for you to feel your steering wheel and floor vibrate while you’re driving. Inspect your tire pressure weekly – Rather than relying on the traditional kick, just get a more accurate reading by buying a tire pressure gauge. Compare your tires’ PSI with the manufacturer’s recommendations to see whether you need a refill. Assess the valve stem – Check whether the valve stem is leaking air by doing a simple test at home. Get some detergent and water to create a soapy solution then pour it around your tire’s valve stem. If you notice continuous frothing, get the stem replaced as soon as possible. Avoid parking under direct sunlight – During summer, the high amount of heat causes tires to expand. Parking your car in an unsheltered area can make your sidewalls to start cracking because the excess heat dries up rubber. Your car manual advises on the maximum load limit in order to maintain good alignment and tire balance. Overloading your car trunk stresses the suspension and brings misalignment. It also affects your steering control because a misaligned car cannot travel straight. The excess weight affects tire balance. When you drive, the excess weight tries to distribute itself across the tires and this brings about wobbling. This uneven weight distribution makes your rear tires wear out faster than the front ones. You’ll notice that the center treads wear out faster similar to a car with an overinflated tire. Don’t pack weight beyond the maximum weight limit – Carry only what you need during the trip inside the trunk. If you have to carry a lot of luggage, then you’ll have to rent a pickup truck. Use anti-slip mats – Anti-slip mats prevent luggage stored in the trunk from moving about. You need to limit movement to avoid driving your car with uneven weight distribution. All your heavy suitcases go on top of the mat. Adjust your tire pressure before the trip – In order for your car to distribute its mass evenly, the tires should have enough pressure to support your luggage. Make sure you fill up your tires the day before your trip. Feathered tire wear occurs due to a high amount of friction produced when misaligned tires halt a high speed. This causes your treads to align horizontally like the strands on a quill. Feathering affects your car’s ability to negotiate corners at high speeds because the tire cannot maintain a firm grip when turning at certain angles. Cars with bad wheel alignment also experience feathered tire wear due to one reason. The toe is out of place. When you hit the brakes at high speed, there’s uneven force distribution that causes treads to wear unevenly. Bad suspension affects your tires by causing cupping wear tire. When the tire rotates, it cannot remain grounded consistently due to bouncing. A cupped tire has bald spots occurring at the center treads. This happens due to uneven friction distribution when negotiating corners or driving up slopes. Improper tire balancing also causes cupping due to uneven weight distribution. If this happens, you need to get a replacement then take your car for alignment and tire balancing. Avoid overloading your car because exceeding the maximum weight capacity strains your suspension. This is similar to over inflation because it affects the center treads. It takes time to develop because it occurs due to a dangerous driving habit. Do you frequently hit the brakes when driving at high speeds? Then your tires most likely have flat spot wears. The center part of your tire has the greatest contact with the road. Halting your car at high speeds puts a lot of strain on your center treads and this causes a faster rate of tire wear. If you’re not a professional race driver, avoid doing doughnuts on the road because you’ll end up buying a new set of tires. A sidewall wear can occur on more than one tire. Most first-time car owners deal with this problem due to driving inexperience. While it doesn’t pose any immediate threat to your life, a sidewall wear can contribute to cracking. You’ll notice that the sidewall’s treads are flat and surrounded by several scratch marks. This happens when an inexperienced driver attempts to park between a car and a wall. Parking your car right next to a curb also causes sidewall wear. Take a penny and insert it upside down at the center treads. Why? because this part has the greatest contact with the road while driving. If the treads cover at least half of the late president’s face, then you have good tires. Make sure your tires are clean to avoid false observations. If the coin lands on a grain of sand, the treads will cover a smaller portion of the coin and may mislead you to purchase new tires. What is a tread wear bar? It’s a small vertical strip of rubber between tire treads. A motorist determines whether he or she needs new tires by rubbing their fingers on the bar and nearby treads. You need a well-lit area to do this inspection. First, spot the tread bar and run your fingers above it. A good tire has treads that are taller than the bar. However, if your treads are on the same level as the tread wear bar, you need new tires immediately. A tire tread gauge is a big improvement to the penny test. It gives you a more accurate reading because you calculate tread depth in millimeters. Plus, some tire tread gauges contain a chart showing you various types of tire treads. How does it look like? It’s the same size as an ATM card so that a driver can carry it at all times. You’ll notice different colored gauges with varying heights. A color code printed on it helps you determine the state of your tire treads. This method is simple yet it helps drivers detect any cupping or tread wear caused by bad wheel alignment. You don’t need any special skills or tools for this exercise. Just make sure your tire is clean and dry. How does it work? Remove your tire from the car then look for a path that’s flat and has no pedestrians. Place your tire in an upright position then give it a slight push to get it moving. Pay attention to how the tire rotates and how it accumulates dirt. If the tire bounces when moving, that’s a sign of cupping. If you’ve just bought a new set of car tires, you should check the treads after every three months. Doing this helps you to know whether the new tires are still in good alignment with your vehicle. It also enables you to determine whether the new tires need another round of balancing. Smart car owners practice responsible driving habits to avoid unnecessary tread wears. In addition to preserving your tires, you avoid ruining your suspension. After reading this article, you now know that a bad suspension causes cupping and feathered tire wears. Finally, make sure you have good steering control before purchasing car tires. 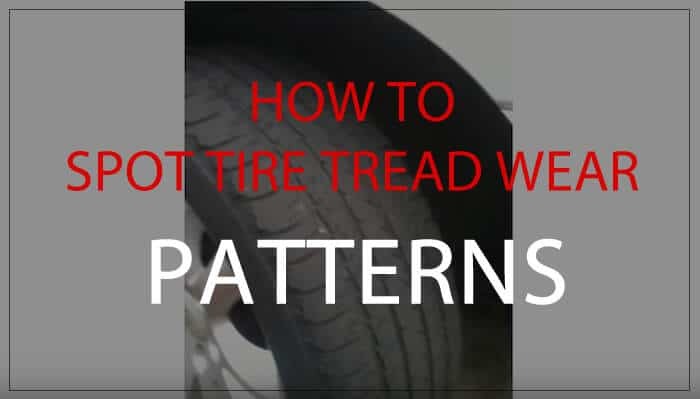 Feel free to bookmark this article because you’ll refer to it when dealing with another tire tread problem.